After I posted my review of the Minolta X-700, I realized that I had neglected to add the final frame I shot that day as I headed back up from the beach towards home. As I walked through the parking lot, I spied an old friend from my past; a Buick Reatta. For a decade beginning in 1989, I managed the in-house advertising department for an automobile dealer group in the the Phoenix/Scottsdale area. One of the perks of the job was I got to drive a demonstrator or "demo" vehicle as we called them. Over the 10 years I worked for this company, I got to drive lots of different new cars. We had multiple franchises including Chrysler, Jeep, Subaru, Hyundai, Isuzu, Hummer, GMC, Pontiac and Buick. The demo policy was that you could select any vehicle you wanted, but as the odometer crept near 5,000 miles, the car had to be sold before you could get a new one. If it hit 5,500 miles, you had to park it until it did sell. I was always careful to choose vehicles I knew would easily sell before the 5,000 mile mark, selecting popular color and option packages and even offering a $100 "spiff" to the salesperson who sold my demo. V-8 Jeep Grand Cherokee Limiteds and Isuzu Troopers were always my favorites. Shortly after I arrived at this company, Buick sent us our first Reattas. The Reatta was intended as Buick's "statement" vehicle. It was a low volume two seater built mostly by hand in the Reatta Craft Centre in Lansing, Michigan. The car came in either a hardtop or convertible and the most popular color was red with tan leather interior. Buick really tried to make the Reatta special. I remember that each one came with a leather book inscribed with the signatures of every GM employee who had worked on that car. Fit and finish was excellent, which was unusual in a time when GM's quality control on other models was suspect. Other than hand assembly and more attention to quality, there was nothing special about the Reatta. Power came from Buick's 3800 V-6 engine which was also being dropped into most of their vehicles including Century, Regal, Riviera and even the big Park Avenue. As soon as the first Reattas rolled off the transports in Scottsdale, the owner of our company selected a red convertible as a demo and drove it for a few weeks before deciding that it was a no go fitting his two Golden Retrievers and himself in the little two seater. His office was across the hall from mine and one day he walked in and asked if I wanted to take over his demo. Of course I did! I remember the Reatta as being a tame, pleasant and very comfortable car to drive...pretty much like a Riviera that had been left in the dryer too long. The 3800 engine had more than enough power for the little car. Visibility was good, seats were comfortable and it was fun dropping the top after work and piloting the car through Echo Canyon on the way home each night. 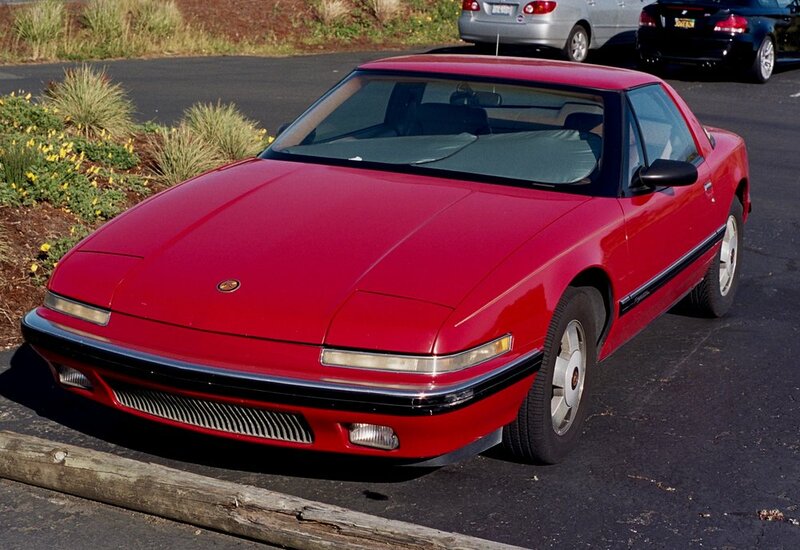 The Reatta only lasted a few years and was considered a failure at Buick. The assembly process pushed convertible prices well over $30,000 and that was a lot of money for a car in the early 90s, especially one this impractical. Production ceased while we still had new Reattas on the sales floor. The old Buick I snapped with my X-700 has been well taken care of. I hadn't thought about the Reatta in years. It was a nice memory.